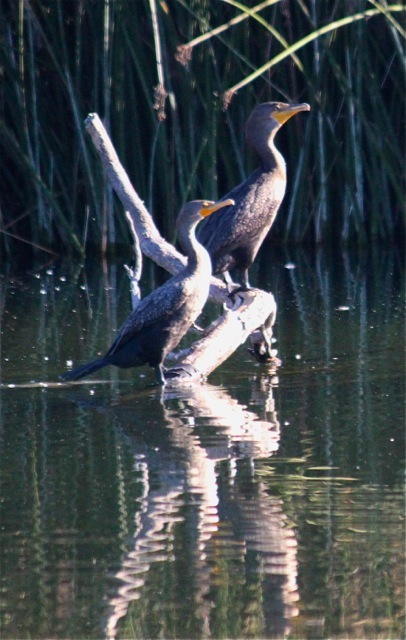 Double-crested Cormorants are large water birds with small heads on long, kinked necks. They have thin, strongly hooked bills, roughly the length of the head. Their heavy bodies sit low in the water. They dive to catch small fish, and after fishing, will stand on docks, rocks, and tree limbs with wings spread open to dry. In flight, they often travel in V-shaped flocks that shift and reform as the birds alternate bursts of choppy flapping with short glides. Photo courtesy of the Jim Serpa Photography Collection.